It’s important that Deaf/HoH children and adults have access to American Sign Language (ASL) as a way to connect with the world around them. ASL interpreters help bridge the gap in communication between the hearing and Deaf/HoH communities to provide a more inclusive experience for all. CHSC offers 24-hour Interpreting Services that provide Deaf/HoH people with access to communication with their physicians, attorneys, employers and for other important life events. Have you always wanted to learn American Sign Language? Learn more about CCDHH's ASL classes. Many American school curricula aren’t designed to properly educate Deaf/HoH students, which makes it challenging for them to receive equal learning opportunities. Incorporating assistive learning aids such as captioning and high-quality interpreting services and prioritizing these Deaf/HoH necessities into the school budget can help combat this disparity. 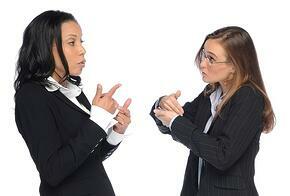 Deaf/HoH individuals are unemployed at a significantly higher rate than the hearing population. From the interview process onward, Deaf/HoH employees experience communication barriers and a lack of cultural awareness, which limits career success. Employers might be afraid to hire a person who is Deaf/HOH because they don’t understand how to open lines of communication and integrate this person into their workforce. Once they have been hired, Deaf/HoH individuals are often given little support and most are overlooked for career advancement. Deaf/HoH people deserve access to equal employment opportunities. The CCDHH offers several vocational services for Deaf/HoH individuals seeking employment. We also offer trainings and workshops to current and potential employers to effectively integrate Deaf employees into their workforce. From the initial encounter with a police officer on to trial and then to sentencing, the legal system poses a myriad of challenges for Deaf/HoH individuals. For those who are unable to hear, dealing with police officers can be unnerving, humiliating and, in some cases, deadly. CCDHH works to educate police departments and justice centers on how to better handle situations involving Deaf/HoH people. CCDHH offers education and training on ADA compliance, Deaf culture, working with ASL interpreters, in addition to ensuring agency and program accessibility. We also provide Deaf/HoH individuals with advocates who will accompany them through any legal situation including court appearances and at police stations.